Denmark’s capital city of Copenhagen is by far the most popular tourist destination in this beautiful Scandinavian country. With so many sights to see, numerous activities to join in on, and tons of delicious food to eat, when you travel to Copenhagen, you'll be sure to find something that suits your needs. The climate in Copenhagen remains rather moderate throughout the summer months, staying in the upper 60s to lower 70s June through August and fluctuating anywhere between the mid 20s and upper 40s throughout the winter months. 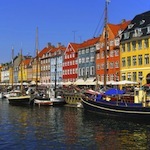 Nordic Saga Tours offer many trips to Copenhagen which can be found on our website. Give one of our experienced travel agents a call; we can't wait to work with you!